This is an archived Argonne News Release Item about the lab's nuclear science and technology legacy. Imagine a nuclear power plant so safe that even the worst emergencies would not damage the core or release radioactivity. And imagine that this is achieved not with specially engineered emergency systems, but through the laws of nature and behavior inherent in the reactor's materials and design. This goal, known in the nuclear industry as "passive safety," is pursued and even claimed by a number of reactor concepts. Argonne's advanced fast reactor (AFR) has demonstrated its passive safety conclusively on a working prototype. "Back in 1986, we actually gave a small prototype advanced fast reactor a couple of chances to melt down," says Argonne nuclear engineer Pete Planchon, who led the 1986 tests. "It politely refused both times." He's joking, but only partly. 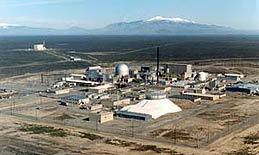 The reactor was Experimental Breeder Reactor-II (EBR-II), located at Argonne-West in Idaho. EBR-II was a small experimental facility, an AFR prototype with a 20-megawatt electrical output. Under Planchon's guidance, a series of experiments were conducted at EBR-II, starting at extremely low power and culminating in two landmark tests at full power that convincingly demonstrated the passive safety advantages of the AFR concept. Argonne researchers demonstrated the passive safety of a nuclear reactor design at the Argonne-West site in Idaho. "We subjected the reactor," Planchon says, "to what are considered two of the most serious accident initiators for liquid-metal reactors: a loss of pumped coolant flow through the core and a loss of heat removal from the primary system. Both tests were performed at full reactor power with the automatic shutdown features intentionally disabled. "Before the tests," he adds, "we had installed special systems to let us stop the reactor at any time. But they weren't needed, because the reactor performed exactly as we predicted." In the first test, with the normal safety systems intentionally disabled and the reactor operating at full power, Planchon's team cut all electricity to the pumps that drive coolant through the core, the heart of the reactor where the nuclear chain reaction takes place. In the second test, they cut the power to the secondary coolant pump, so no heat was removed from the primary system. Chart of reactor core temperature during 1986 loss-of-flow-without-scram test. "In both tests," Planchon says, "the temperature went up briefly, then the passive safety mechanisms kicked in, and it began to cool naturally. Within ten minutes, the temperature had stabilized near normal operating levels, and the reactor had shut itself down without intervention by human operators or emergency safety systems." The reactor was shut down permanently in 1994, having completed its research mission. But for 30 years, it operated safely and reliably while providing all the electricity for Argonne-West, the 900-acre site Argonne operates near Idaho Falls, Idaho. The reactor was a prototype AFR and demonstrated once and for all the technology's passive safety. The basic purpose of reactor safety is to protect the public and plant workers from harmful radiation exposure. "To achieve this," he continues, "you have to provide for passive performance of three basic safety functions: You have to maintain a proper balance between heat generation and heat removal, you have to remove decay heat, and you have to contain radioactive materials, primarily fuel and fission products." Decay heat comes from radioactive materials in the core, even when the reactor is shut off. The AFR's passive safety is based on three key aspects of its materials and design: its liquid sodium coolant, its pool-type cooling system and its metal alloy fuel. The sodium coolant is a highly efficient heat-transfer material and has the additional advantage of operating at normal atmospheric pressure. In the typical commercial reactor, the water coolant must be pressurized at 100-150 times normal to keep it from boiling away. But sodium can cool the core at normal pressure, because its boiling point is 300-400 degrees Celsius (575-750 degrees Fahrenheit) higher than the core's operating temperature. "Basically," says Deitrich, "the sodium pool eliminates the possibility of the coolant boiling away during an accident and leaving the core uncovered, which is one of the more serious potential trouble spots in a light-water reactor. By submerging the core in thousands of gallons of liquid sodium, you provide the reactor with an immense heat sink that adds greatly to its safety. If the reactor starts to overheat, the pool can absorb vast amounts of heat and never approach its boiling point." Diagram of major components in an advanced fast reactor. And the pool design, he adds, passively removes decay heat if the normal heat-removal systems fail. "When a reactor shuts down," he explains, "it continues to produce heat, because the core contains a large inventory of radioactive material that releases energy as it decays. But in our AFR concept, natural convection in the sodium pool can transport the decay heat to downstream systems. All of this can be done passively, without need for active systems or components." Sodium also increases the reliability and long life of components, partly because it does not corrode common structural materials, such as stainless steel. "Our experience in decommissioning EBR-II," says John Sackett, Argonne's deputy associate laboratory director for Argonne-West, "shows that materials and components in the core can operate in liquid sodium without significant damage or corrosion. We removed components from the sodium pool after 30 years and found them just as shiny as the day they went in. We saw original marks that welders and other craftsmen had made 30 years earlier when they created the component." Other sodium properties also enhance reactor safety and reliability. For example, sodium is chemically compatible with the metal fuel. This makes small failures in the cladding, the stainless-steel tubes that encase the fuel, far less likely to grow. In addition, sodium tends to bind chemically with several important radioactive fission products, which reduces radioactive releases if fuel fails. Although sodium can be dangerous if allowed direct contact with air or water, with appropriate care, it makes a nearly ideal coolant. "Properly handled, as we did for 30 years at EBR-II, sodium offers significant advantages over water as a coolant," says Deitrich. 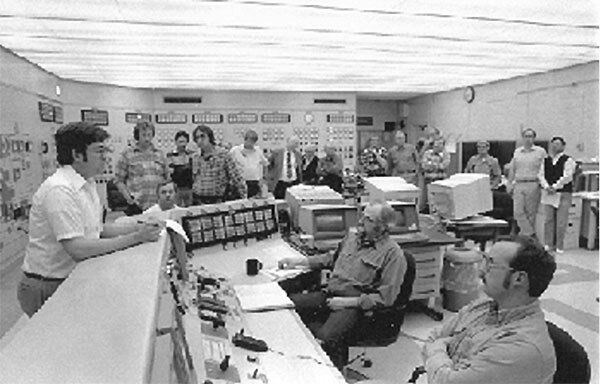 Chuck Matthews (left) gives final instructions before the 1986 passive safety test at EBR-II. The third leg of AFR safety is its metallic fuel — an alloy of uranium and other metals. Metal fuel provides inherent, "reactivity feedback" mechanisms that alter a reactor's power when its core temperature changes. The primary feedback in a metal-fuel reactor comes from thermal expansion of fuel, sodium and steel around the core. Simply put, when the core temperature increases, the fuel, sodium and the stainless steel components in the core expand, and that tends to shut down the reactor. "When the fuel expands," Deitrich explains, "the distances between the fissile nuclei increase. This slows the chain reaction, because the neutrons necessary to drive it strike fewer fissile nuclei." Radial expansion of the core also limits reactor power. "Normally," he says, "the sodium and steel around the core reflect neutrons back into the core to help maintain the chain reaction. 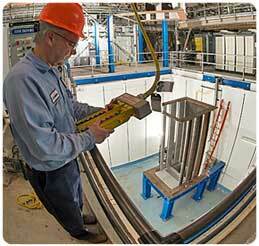 But when sodium and steel expand, more neutrons escape from the core and are unavailable to drive the reaction." The safety bottom line for the AFR is that all these natural feedback mechanisms tend to maintain coolant temperature near its normal 500 degrees C (930 degrees F) operating value — well below sodium's 900 C (1,650 F) boiling point — even when the reactor loses its engineered cooling systems. If an AFR started to overheat, the natural properties inherent in its materials and design would step in to shut it down without the intervention of human operators or specially engineered safety systems. "When you put all these things together," Deitrich concludes, "you have a high level of passive safety. We've demonstrated all these effects in a working reactor. Each individual effect is predictable and so is their combination. Together, they provide a natural and reliable safety response based on features inherent in the advanced fast reactor concept." The article in this page is an archived Argonne News Release Item about the lab's nuclear science and technology legacy.